» What is the elemental composition of a cell? One of the most interesting chemical asymmetries associated with life on Earth is the mismatch between the composition of cells and of inanimate matter. As a result of the rich and diverse metabolic processes that make cells work, living chemistry is largely built around carbon, oxygen, nitrogen and hydrogen, with these elemental components serving as the key building blocks making up the cell’s dry weight. Figure 1: Back of the envelope estimate of the number of atoms in the human body. Based on the major elements in the body, the mass of a person is converted to moles of atoms and from there to the absolute number giving an order of magnitude quick estimate. The dry weight of E. coli contains for every nitrogen atom about 2 oxygen atoms, 7 hydrogen atoms and 4 carbon atoms. Hence, the empirical composition can be approximated as C4:H7:O2:N1. The empirical composition on a per carbon basis yields the equivalent empirical composition of C:H1.77:O0.49:N0.24 (BNID 101800). In absolute terms, there are about ≈1010 atoms of carbon in a medium sized E. coli cell (BNID 103010), on the order of the number of humans on earth and interestingly, less than the number of transistors in a state of the art computer chip. For budding yeast the proportional composition is similar, namely, C:H1.61:O0.56:N0.16 (BNID 101801). How many atoms are in the human body? One could answer “it depends” (e.g. on the weight), but we much prefer to estimate the order of magnitude, as shown in Figure 1, by thinking of an adult of somewhat less than 100 kg and an atom in the human body being on the average of mass 10 Da, thus arriving at about 1,000 mol or somewhere between 1027-1028 atoms. Figure 2: Comparing the elemental composition by weight in percent for the most abundant elements in the human body (A) to the Earth’s crust and (B) to the Oceans. Only elements that are at a concentration of at least 1 part per million in the human body are depicted. Some elements whose concentration is lower than the minimal value on the x-axis range are denoted with an arrow. Data from BNIDs 110362, 107256, 107257, 107258, 103490. As noted above, it is interesting to compare the composition of cells to that at the Earth’s crust or the Oceans as shown in Figure 2 (BNID 101362). Strikingly, carbon and hydrogen, majority players in living matter are relatively rare in the Earth’s crust. Carbon comes in as only the 17th most abundant element and hydrogen as a slightly higher constituent coming in 10th place, way behind the major constituents, oxygen (60.5%), silicon (20.5%) and aluminum (6.2%). Similarly, in the atmosphere, the main carbon containing compound, CO2, makes up merely ≈380 parts per million and extracting this dilute resource is the main reason for the need to water plants. Plants lose water when opening their stomata, small pores on leaves that are the channels for importing carbon dioxide molecules. This mundane process accounts for a staggering two thirds of humanity’s water consumption (BNID 105887). Hydrogen, which was prevalent in the early Earth’s atmosphere was lost to space during Earth’s history. This process of loss is a result of hydrogens low mass, because the thermal velocities it attains at the high temperatures prevailing in the atmosphere upper layers provide enough kinetic energy to overcome the Earth’s gravitational pull. This trickling continues today at a rate of ≈3 kg/s from earth’s atmosphere (Catling 2009). Figure 3: Back of the envelope calculation to estimate the ratio of different elements in the cell. Only the dominant constituents are considered, namely amino acids composing proteins and nucleotides composing RNA and DNA. Can we say something more about the elemental compositions of living matter by thinking about the makeup of the key macromolecular constituents of cells? In particular, how might we infer the elemental ratios from our acquaintance with the cell’s components without consulting the empirical measurement? A bacterial cell has about 55% protein, 20% nucleic acids, 10% lipids and another 15% of various other components (by weight, BNID 101436). 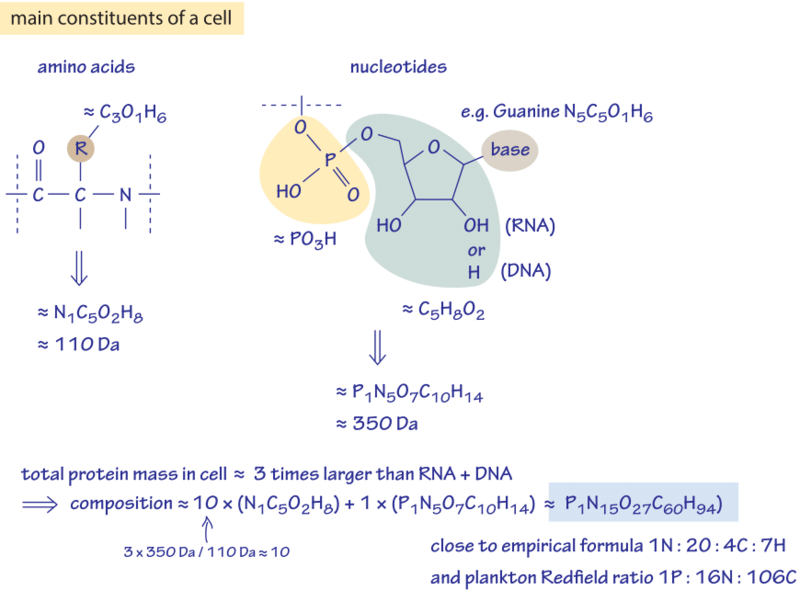 Exploiting the fact that the mass ratio of proteins to nucleic acids is about 3:1, we explore in Figure 3 how far a few simple facts about these two dominant components can take us in estimating the elemental composition of a cell. A nucleotide is composed of a phosphate (PO4) and ribose (C5H8O2) backbone and a base (~N5C5O1H6 – using guanine as our representative example). Thus the total chemical composition is P1N5O7C10H14 with a total mass of about 350 Daltons (BNID 104886). An amino acid consists of a backbone with a peptide bond –RC(O)NH- where the first group (R) is a carbon harboring a residue that on the average is crudely about 3 carbons, 1 oxygen and 6 hydrogens leading to a total elemental composition of N1C5O2H8 and a mass of about 110 Dalton (BNID 104877). If we focus our attention only on the protein and nucleic acid content of cells, we are now prepared to estimate the overall composition of a cell. To reason this out, we recall that the mass of protein in a typical bacterium is roughly 3-fold larger than the mass of nucleic acids. Further, since nucleic acids have roughly three times the mass of amino acids, this implies that for every nucleotide there are roughly 10 amino acids. We need to evaluate the chemical composition of a mix of 10 amino acids and 1 nucleic acid resulting in the stoichiometric relation 10×(NC5O2H8)+1×(PN5O7C10H14) = (C60:O27:H94:N15: P1). Normalizing by the number of nitrogen atoms this is C4:H6.3:O1.8:N1 pretty close to the empirical value of C4:H7:O2:N1 (or C:H1.77:O0.49:N0.24). This estimate can be refined further if we include the next largest contributor to the cell mass, namely, the lipids that account for ~10% of that mass. These molecules are mostly composed of fatty acids that have about twice as many hydrogens as carbons and very little oxygen. Including lipids in our estimate will thus increase the proportion of H and decrease that of O which will bring our crude estimate closer to the measured elemental formula of cell biomass. The point of going to the trouble of estimating something that is already known through an empirical formula is that it serves as a critical sanity check of our understanding of the main biological components that determine the cell’s composition. Why were these particular elements chosen to fulfill biological roles? Why is carbon the basis of life as we know it? These questions are discussed in detailed books on the subject (Fraústo da silva and Williams, Sterner and Elser). Here we end by noting that there could still be surprises lurking in the field of the elemental stoichiometry of life. For example, a recent high-profile publication claimed to reveal the existence of bacteria that replace the use of phosphate by the element arsenic that is one line lower in the periodic table and highly abundant in Mono Lake, California. However, more rigorous studies showed these organisms to be highly resistant to arsenic poisoning but still in need of phosphate. The vigorous discussion refuting the original claims led to renewed interest in how elemental properties constrain evolution.